Thanks to all who "opened their doors" when I Knocked .It was a pleasure hearing from you after so long. Some days back I happened to see this tutorial to crochet a Loop Stitch . The inspiration for the pictures that you see below came from that video.Instead of crocheting loops, I embroidered them. I started my trials with the small flower on the left. It looked pretty good. Next, I tried making two layers and found it difficult to do because of the tiny space inside. 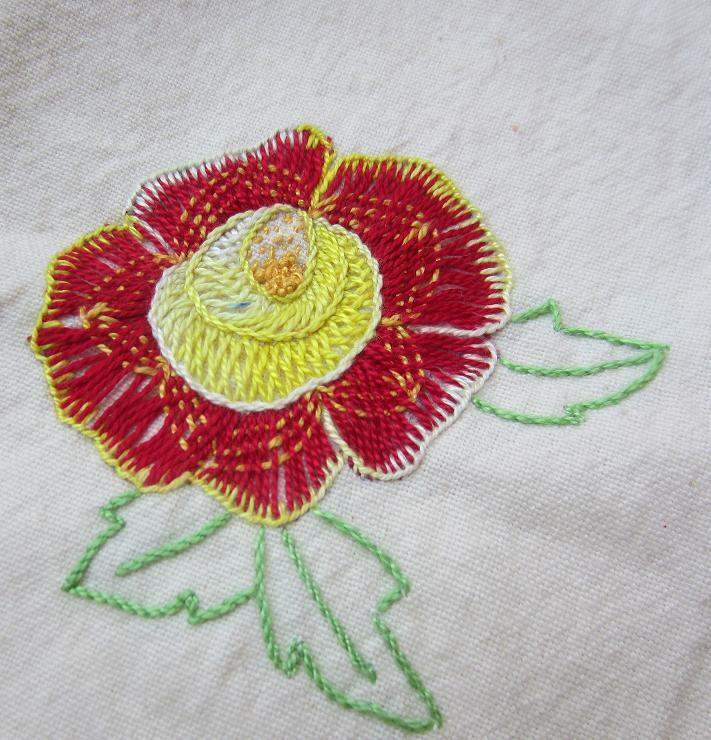 I tried the layering again for a bigger flower ,first the red petals were stitched and then the yellow ones. Happy with the outcome.What do you think? There a few gaps visible after the "bath". But those can be corrected. Still ,no more washing machine, only hand wash from now on - I've tortured her enough. And thus ends my first "real" embroidery post after a long time. I hope you enjoyed visiting and viewing. 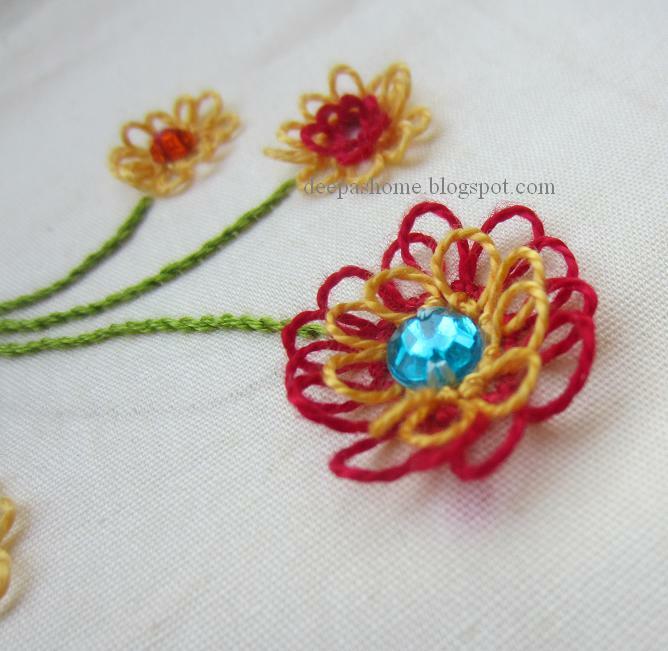 Your looped flowers are so pretty! Hey Dear, its great to see you back with such a lovely piece. It's beautiful.I like more the big flower with red and yellow. 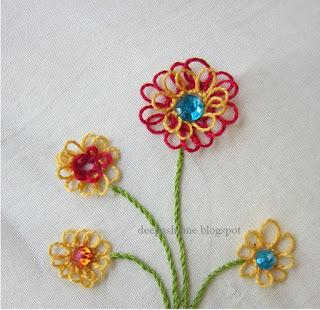 Deepa, what a beautiful flower, love the stitch, love the look, and love the colours... as for the little napkin, now that it's gone through the wash twice, I don't think you will have to worry about any more wear on it, and it is indeed lovely too! Hugs. It is very pretty! I wanted to pin it, but I'm not allowed? Nice flowers, Deepa. Reminds me of the stitching used for turkey work. These are HAPPY Flowers. I love them. Since I crochet too, I'm going to check out the crocheted version also. Those flowers are very pretty. Clever to translate a crochet stitch to embroidery. Nice to see you again!! Welcome Back. Somehow I missed your earlier post, Hope your nose is treating u well now!! 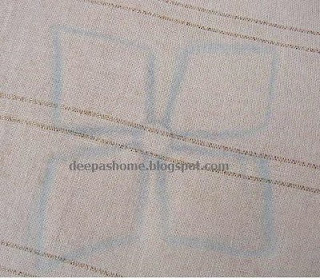 Deepa, this looks like what I have always known as Turkish stitch. 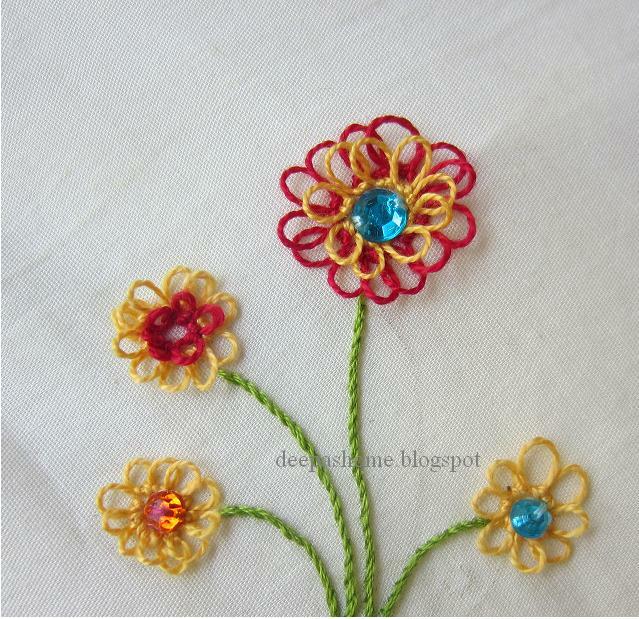 A sort of looped backstitch. If you Google it you should find it either as Turkish embroidery stitch or Turkey work. Its a lovely looking stitch and imitates a fluffy rug when sewn close together and the loops cut as in carpet pile. I've used it for dolls eyelashes. This stitch has been hard to learn. I did do one, but never did it again because of the difficulty. It is called the knotted loop stitch if it is the same one I saw in a Jenny Bradford book (Textured Embroidery)which you can see the cover page on amazon.com. There are even more rows. It is a beautiful stitch and you did a great job. Are you going to have a tutorial on it. I gave up, just couldn't do without getting frustrated. I hope I didn't rain on your parade. It eludes me, ugh!!!! 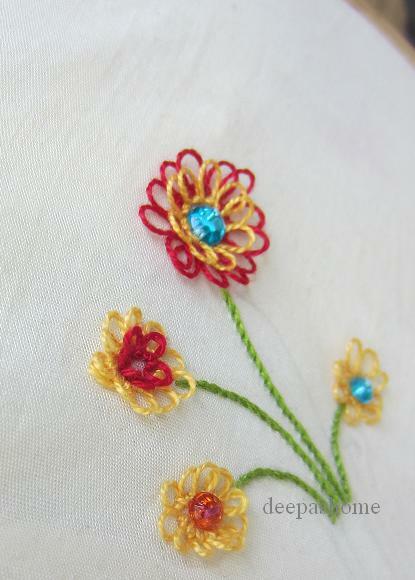 This is a come back in style, with a new stitch and pretty flowers! Happy to see u again with a pretty loopy flower. Hi Deepa! So good to hear from you, dear friend! Beautiful flowers - especially nice to see them today after we've had a day of dull dreary rain! I love those flowers and I'm glad the napkin survived the wash!